Here's the ZGBlog promised on January 22nd, about how traveling merchants will protect themselves in the coming zero government society. Its roots go back a couple of centuries and more. The defense of a free society against invasion is not hard to visualize; like patriots in every country the FedGov has invaded, residents would each arm themselves well and harass the invader's agents until they left. Knowing this in advance, most if not all potential invaders would not invade. However that does leave one gap: a merchant from the free America sails away for trade (to fetch some oil, for example) and suffers a seaborne attack by pirates - the literal sort. At home, the resolute defenders have all the advantage - but a lone ship on a big sea is highly vulnerable. So what then? This actually happened shortly after the USA began, and it occasioned the founding of the US Navy. 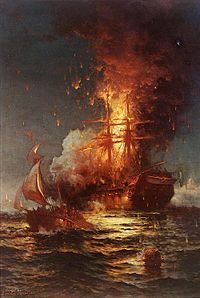 Pirates off the North African coast would attack passing ships, capture the crew and merchandise, sell the latter, enslave or sell the former, and use or sell the ship. The Wikipedia article is informative; I had no idea it was such a well-seasoned business. North African pirates had operated since the 9th century, and after 1487 became an ongoing, serious menace to shipping with the blessing of the Ottoman Empire. Predominantly Muslim, there were Christian privateers participating from time to time - but by 1784 it had long been a state-sponsored activity and periodically treaties would be signed (then broken) by governments of the Muslim states from Morocco to Libya. Captured crews were horribly treated and over the years, as many as one million may have been killed or enslaved; navies from Britain, France and Spain, as well as the new-born United States, took turns to combat the menace. So we can reflect that the commandments "Thou shalt not kill" and "Thou shalt not steal" carried little effect in Islam, even though that religion claims to be rooted in the Old Testament; and that governments abhor piracy only if someone else is doing it. Muslims perhaps rationalized the violence by claiming they attacked only infidel ships, and killing infidels is quite okay. I wonder if that has changed, since. Mind, there's no comfort here for Christians; adherents of that religion too were busy 2,000 miles further South, kidnapping nearly ten million native Africans for purchase by the very people who were so indignant about the Barbary pirates. Menace it long was, then, and menace it still is today, off the Horn of Africa - and again, Muslim zealots are responsible. They use fast, small boats to board ships large and small, and hold the crew and/or cargo to ransom. Until the rational ethics of the free society have spread worldwide, traders and tourists from the coming free America will need defending. How? The answer in 1784 was of course collectivist; merchants applied to the government for help, and got it after 1794 in the form of the US Navy - which did a fine job of discouraging piracy against US ships, celebrated in the second line of the hymn of the US Marines. This week's skillful rescue mission by SEALs in Somalia continues the tradition. So the merchants used the force of government to make everyone else pay for their defense, via taxation. The pirates stole from the merchants, the merchants demanded help from the FedGov, and the FedGov stole from everyone else; the entire scene was and is a rats' nest of thievery. By contrast, merchants in the ZGS operating ships in pirate-infested waters will pay for their own defenses. Follow the money, notice how that will work. Because of that added cost, what they import or export will be more expensive. Domestic producers will therefore have a price "umbrella" under which to attempt to compete; they will therefore take a larger market share. That will tend to reduce the volume of merchant shipping. However there will be no taxes for anyone, so the whole economy will be far bigger, which will in turn require more international trade, and hence more shipping; so there will be several major influences both stimulating and moderating, dynamically, the need for goods to be shipped. I don't predict how this will settle down, or even whether it will settle - but am very confident that the free market will govern the outcome even after the cost of defense against piracy is paid; that is, the cost of such defense will be exactly right, precisely what current market conditions make it expeditious to bear. This will be so even if a whole foreign State should become a major menace to shipping. Imagine a fanatical Muslim Egypt, hiking the toll for the Suez Canal by a factor of 100. That would certainly be a form of piracy. What would happen? - few would pay it; international trade would reduce sharply as above, stimulating alternatives like domestic production. Egypt, meanwhile, would lose a major revenue source and would sink into poverty; the mullahs in command would not care, because their myths would stay intact, as would their grip on power; but everyone else would lose. Until they shook off the mythology and stopped working for government. How will the travel-insurance companies spend their revenues? - hard, again, to predict; but I imagine them offering shippers competing services of protection for a fee, based on the routes to be followed and the degree of self-defense employed aboard. Shippers do have one advantage: pirates have no desire to sink the ship they are attacking - they want to capture it intact. The defenders have no such limited objective; if pirates attack, deadly intent may reasonably be assumed and lethal defense may ethically be employed. Large ships may well carry a well-trained team of armed defenders on board, while insurers will patrol the seas of known hot-spots using drones, fighter aircraft and missiles purchased at good prices from auctions of surplus FedGov equipment - putting some of it, after all, to good use when customers signal an emergency. Lastly, I believe piracy will be a temporary problem. Once America is rid of the curse of domestic pirates (government) news of the rapidly rising resulting prosperity will sweep the world and motivate residents of every country to think "me too." The prerequisite process of universal re-education will take longer in some than in others, longest perhaps in Muslim lands where the indoctrination has been heaviest. But once it's over, and the age of government is history everywhere, state sponsored piracy will clearly end and it will fast become unprofitable as a private one too, like all other forms of organized crime.